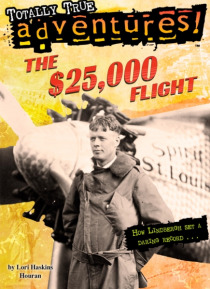 Can Charles Lindbergh set a world record? Follow America's first superstar pilot in this high-flying Totally True Adventure. � In the 1920s, flying was brand new—and very dangerous. A $25,000 prize for the first flight from New York to Paris went unclaimed for years. Many teams tried. And many teams failed. Still, Charles Lindbergh felt he had a shot at the prize. He wasn't famous. He wasn'… t rich. But he was determined. He'd cross the ocean in a tiny plane . . . and he'd do it all by himself! � After you've read the story, don't miss the bonus content with extra facts, a timeline, and more 20th century history, geography, and science-tie-ins!